The recent protests by black players in the National Football League were rather sad for their fruitlessness. They may point to the end of an era for black America, and for the country generally—an era in which protest has been the primary means of black advancement in American life. There was a forced and unconvincing solemnity on the faces of these players as they refused to stand for the national anthem. 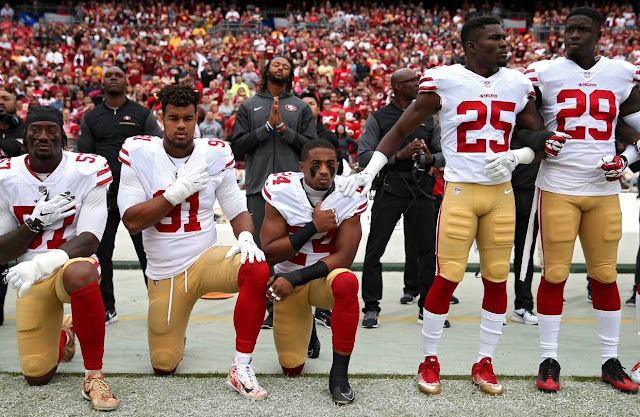 They seemed more dutiful than passionate, as if they were mimicking the courage of earlier black athletes who had protested: Tommie Smith and John Carlos, fists in the air at the 1968 Olympics; Muhammad Ali, fearlessly raging against the Vietnam War; Jackie Robinson, defiantly running the bases in the face of racist taunts. The NFL protesters seemed to hope for a little ennoblement by association. And protest has long been an ennobling tradition in black American life. From the Montgomery bus boycott to the march on Selma, from lunch-counter sit-ins and Freedom Rides to the 1963 March on Washington, only protest could open the way to freedom and the acknowledgment of full humanity. So it was a high calling in black life. It required great sacrifice and entailed great risk. Martin Luther King Jr. , the archetypal black protester, made his sacrifices, ennobled all of America, and was then shot dead. For the NFL players there was no real sacrifice, no risk and no achievement. Still, in black America there remains a great reverence for protest. Through protest—especially in the 1950s and ’60s—we, as a people, touched greatness. Protest, not immigration, was our way into the American Dream. Freedom in this country had always been relative to race, and it was black protest that made freedom an absolute. It is not surprising, then, that these black football players would don the mantle of protest. The surprise was that it didn’t work. They had misread the historic moment. They were not speaking truth to power. Rather, they were figures of pathos, mindlessly loyal to a black identity that had run its course. What they missed is a simple truth that is both obvious and unutterable: The oppression of black people is over with. This is politically incorrect news, but it is true nonetheless. We blacks are, today, a free people. It is as if freedom sneaked up and caught us by surprise. What happened was that black America was confronted with a new problem: the shock of freedom. This is what replaced racism as our primary difficulty. Blacks had survived every form of human debasement with ingenuity, self-reliance, a deep and ironic humor, a capacity for self-reinvention and a heroic fortitude. But we had no experience of wide-open freedom. Watch out that you get what you ask for, the saying goes. Freedom came to blacks with an overlay of cruelty because it meant we had to look at ourselves without the excuse of oppression. Four centuries of dehumanization had left us underdeveloped in many ways, and within the world’s most highly developed society. When freedom expanded, we became more accountable for that underdevelopment. So freedom put blacks at risk of being judged inferior, the very libel that had always been used against us. We can say that past oppression left us unprepared for freedom. This is certainly true. But it is no consolation. Freedom is just freedom. It is a condition, not an agent of change. It does not develop or uplift those who win it. Freedom holds us accountable no matter the disadvantages we inherit from the past. The tragedy in Chicago—rightly or wrongly—reflects on black America. That’s why, in the face of freedom’s unsparing judgmentalism, we reflexively claim that freedom is a lie. We conjure elaborate narratives that give white racism new life in the present: “systemic” and “structural” racism, racist “microaggressions,” “white privilege,” and so on. All these narratives insist that blacks are still victims of racism, and that freedom’s accountability is an injustice. We end up giving victimization the charisma of black authenticity. Suffering, poverty and underdevelopment are the things that make you “truly black.” Success and achievement throw your authenticity into question. Protest is the action arm of this identity. It is not seeking a new and better world; it merely wants documentation that the old racist world still exists. It wants an excuse. For any formerly oppressed group, there will be an expectation that the past will somehow be an excuse for difficulties in the present. This is the expectation behind the NFL protests and the many protests of groups like Black Lives Matter. The near-hysteria around the deaths of Trayvon Martin, Michael Brown, Freddie Gray and others is also a hunger for the excuse of racial victimization, a determination to keep it alive. To a degree, black America’s self-esteem is invested in the illusion that we live under a cloud of continuing injustice. When you don’t know how to go forward, you never just sit there; you go backward into what you know, into what is familiar and comfortable and, most of all, exonerating. You rebuild in your own mind the oppression that is fading from the world. And you feel this abstract, fabricated oppression as if it were your personal truth, the truth around which your character is formed. Watching the antics of Black Lives Matter is like watching people literally aspiring to black victimization, longing for it as for a consummation. But the NFL protests may be a harbinger of change. They elicited considerable resentment. There have been counterprotests. TV viewership has gone down. Ticket sales have dropped. What is remarkable about this response is that it may foretell a new fearlessness in white America—a new willingness in whites (and blacks outside the victim-focused identity) to say to blacks what they really think and feel, to judge blacks fairly by standards that are universal. We blacks have lived in a bubble since the 1960s because whites have been deferential for fear of being seen as racist. The NFL protests reveal the fundamental obsolescence—for both blacks and whites—of a victim-focused approach to racial inequality. It causes whites to retreat into deference and blacks to become nothing more than victims. It makes engaging as human beings and as citizens impermissible, a betrayal of the sacred group identity. Black victimization is not much with us any more as a reality, but it remains all too powerful as a hegemony.